1. Controlling to and facilitation national education. 2. Providing benefits for Kurusapa. Under its philosophy of undertaking only such business as brings benefit to the national system of education as a whole , KBO supplies services and quality products in a scrupulousmanner and at the best possible price. After the establishment of BOWT, the Ministry of Education transferred Suksapanpanit, a trading unit of the Department of General Education, and a printing school belonging to the Department of Vocational Education to KBO in order to enable it to begin operations. BOWT has never recieved capital investment from the government. In its early years, it was granted a long-term loan of one million baht by the Ministry of Education, the Department of Religious Affairs, and the National Scouts Committee. The loan was repaid in full in 1968. Over the years, BOWT has come to be recognized as a leader in the textbook and educational materials market. Since its founding in 1950, BOWT has worked in close collaboration with the Department of Curriculum and Instruction Development and the Institute for the Promotion of Science and Technology in publishing textbooks, educational forms, educational materials, etc. Today, it is fully responsible for the production of all supplementary books, teachers' guidebooks, audio-cassettes, video-cassettes, and other form of multimedia, such as CAI and CD-ROMs. In addtion, BOWT has been involved in reading activities for over fifty years, and has published books for children as well as general books for readers of all ages. Kurusapa LAdprao Printing House, which is the main plant of BOWT, is located on a 20-acre site in Ladprao Road, Bangkok. It is a fully intergrated house which conducts pre-press processing, printing, book-binding and finishingservices under one roof. Kurusapa Ladprao Printing House is a service centre for printing and it has a capcity of 100 million volumes per year. It provides services not only for education, but also for clients in many other fields. The pre-press process is now computerized and employs a desktop publishing (DTP) system for typesetting, designing, pagesetting, scanning, retouching, ect. Kuruspan Ladprao Printing House is equipped with modern presses. Both sheet-fed presses and web-fed presses are used for high quality printing in on, two, three, four of more colours. The process of binding paperback and hard-cover books is fully automated. BOWT also produces and supplies other educational media, equipment and instruments. It has three factories engaged in the manufacture of these supplies. It is located in Samutsakorn Province. The factory is responsible for the design, production and supply of scientific instruments. It specialises in the design and manufacture of school uniforms. It is responsibible for the development and production of colours for printing, and is responsible for other school equipment as well as for the installation of scientific laboratories in schools. In the beginning, the sales department of BOWT was located in a small section of Mansion 9 in Rachadamneon Road. Today, however, Mansion 9 is the head office of BOWT and of Suksapanpanit, a sales centre for all kinds of educational supplies. BOWT has made educational supplies available to the general public by establishing 11 branches of Suksapanpanit in Bangkok and the suburbs. BOWT has also developed sales and marketing channels by signing distributorship areements with over 300 distributors throughout the country. - Financial assistant to Kurusapa and the Ministry of Education. - Participant in the Dual System Training Project of the Vocational Department. - Participant in the Rachamangkala Institute of Technology Program to organize training courses for students in printing skills. - Provider of scholarships to students of photography and printing technology in the Faculty of Science at Chulalongkorn University. - Sponsor of a summer program that enables students to work and receive training in the BOWT office and factory.
" BOWT NATIONAL EDUCATION MEDIA LEADER "
Download BOWT's MAP Click here! Download Kuruspa Publishing House's MAP Click here! 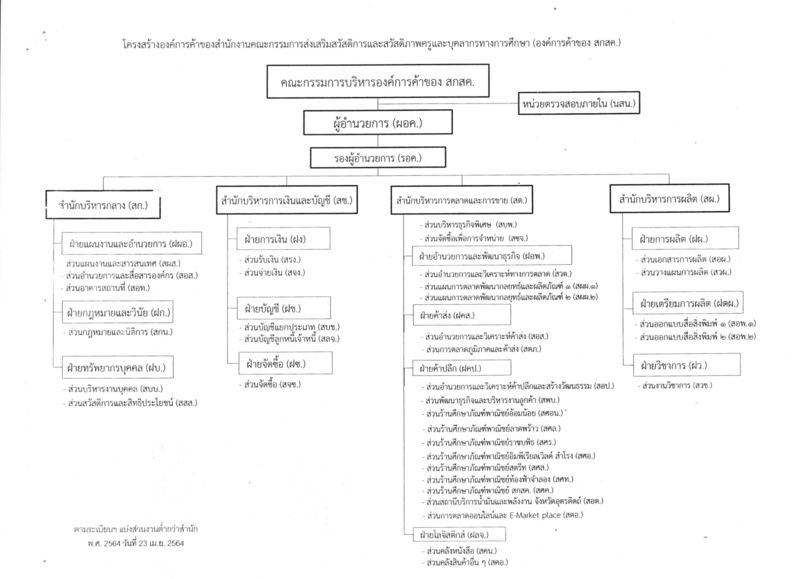 Download Administrative Flow Chart Click here!